When you see a five out of five rating here on Clickfire, it means the software or service we’re reviewing really has to hit on all cylinders. Factors like pricing, free trial offerings, product features, simplicity and interface all calculate into the overall formula. So when Fuze Meeting hits all of those nails on the head, you can expect this five-star review won’t exactly spend a lot of time on the software’s downsides. In many ways that means this Fuse Meeting review will more closely resemble a sales pitch or a list of product features than a review. But once you explore the product for yourself and sign up for the free trial, you’ll see why we decided to bring out the five-star guns. 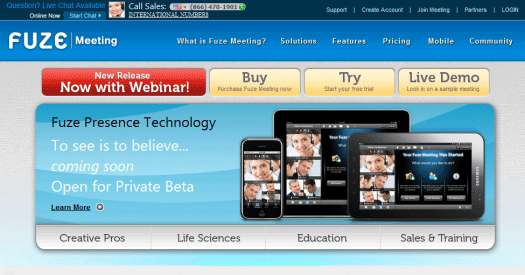 Fuze Meeting is simply a quality, comprehensive software with a pricing structure that beats out leading competitors. If you want to find more than that, well, that probably makes you a software pirate and that’s not Clickfire’s bag. What more could you ask for in a Fuze Meeting review? Well, how about I explain how I came to the five-star conclusion? Admittedly, when most of us hear about a computer’s high-definition capabilities, we don’t necessarily think “Oh, great, I can’t wait to see my colleagues’ nose hairs!” But the high definition experience is an important piece of the Fuze Meeting puzzle, so we’ll touch on that – and a menagerie of other features – here. First, to be sure, high definition capabilities are not the end-all-be-all in web conferencing. I’ve never been much for “bigger, sharper, better” myself. But when you throw in the other features like easy file sharing and viewing, it makes for a much more professional, clean experience overall. In other words, Fuze Meeting’s actual viewing quality can compete with the best web conferencing platforms out there. That’s a good start. But there’s more to the story here. I’ve always been one for easy, simple interfacing no matter how comprehensive or even complicated a product can get. Fuze Meeting does this well with an interface that takes all the guesswork and “how do you work this thingamajig?” out of holding online meetings. Well, okay, I’m sure someone in your office will still say “how do you work this thingamajig?” but you get my point. With this general ease-of-integration comes connectivity with iPhones and other mobile interests that will keep just about everyone in your office from making an excuse. “You couldn’t attend the meeting? What, is your iPhone broken?” If you’re an employee who likes to sneak in long lunch breaks, this isn’t always the best news, but if you’re an employer and you want to get things done, it’s a great way to crack the whip. In the interests of better technology and flexibility, of course. Not too shabby, and certainly less intimidating than some other web conferencing software out there. I’m looking at you, GoToMeeting. Between all of the features and methods of integration with other technology, Fuze Meeting has already put together a pretty compelling reason you’ll at least want to try them out – and yes, they do provide you with a free trial. But it’s the long-term quality of Fuze Meeting’s pricing structure that will really have you wondering if this isn’t the best software available for the price. Here’s why. Yeah, that about sums up this review. Sure, it pays to be skeptical of this number. After all, if $29/month only gets you a meeting with a maximum of five people, then it’s all been for naught and GoToMeeting and Webex win the day. But as it turns out, that $29/month will get you up to 25 visitors per meeting which means it actually outpaces the lowest rung on the pricing ladder at those other two places. This simple pricing comparison does stand up to scrutiny, and it’s one of the chief reasons I’m putting Fuze Meeting at five out of five stars. If you’re still skeptical about the pricing or think maybe it’s because the software itself is sub par, Fuze Meeting puts its money where its mouth is with a 30-day free trial. Since I’m a huge fan of trying products out with minimal risk, this is right up my alley, and considering this review’s glowing recommendation of Fuze Meeting, you should probably want to give it a try yourself. That’s all. It sounds pretty simple, but that’s really all there is to it. Put together a product that competes technologically with all the others while besting them in price and you’ve got a real winner. When you put it all together like Fuze Meeting does, you’ve got yourself a recommendation. This is the part of the review where I usually tell you if there are people this product won’t be suited for. But if you’ve come this far, chances are that you’re interested in web conferencing software and you’ve given the issue a good deal of thought. If that’s you, then Fuze Meeting is a solid choice. It’s that simple. Hey, I just call ’em like I see ’em. GoToMeeting and Webex are worthy contenders for your affection, but a truly savvy tech junkie will give Fuze Meeting’s free trial a go and see if what I’m saying is really true. Go ahead. I think you’ll find a software that will be your company’s friend for a long, long time. These guys have so much promise. I love the technology. But their execution fails at every turn. During my first attempted meeting recording, the audio was corrupted and they couldn’t recover it. We were recording it so that our team could review on an on-going basis. Instead it was lost. The audio quality on their built in bridge leaves a lot to be desired. Heavy delay and not good quality overall. We finally just gave up and went to our normal bridge – which defeated a lot of the planned benefit. The straw that broke the camel’s back was that one of their nice features is what they call Fuze In. When you start a meeting, the system prompts you to click “call” and it will call you to have you join the meeting. Nice touch. Except that they don’t tell you that by doing that, it is billable minutes. So I spent $40 this month for crappy audio quality – just so I could have the privilege of not having to dial those 10 digits. When I complained, I got a response that it was in the billing page when I signed up (in small print at the bottom – and you better realize that’s what the “Call Me” feature means.) So, I will be canceling this service this week – as soon as I can find a replacement. So frustrating. I’ve used Fuze Meeting now for 2 months.